i) Production Economics and Farm Management. iii) Agricultural Marketing and Cooperatives. iv) Agricultural Policy and Development. vi) Natural resources and Environmental Economics. ii) Resources and Environmental Economics. iii) Agribusiness and Financial Management. iv) Agricultural Trade and Marketing. vii) Agricultural Enterprise Development and Project Management. viii) Quantitative Research Methods/ Econometrics. iv) Gender Issues in Agricultural Extension/Rural Development. i) Animal Nutrition and Biochemistry. ii) Animal Breeding and Genetics. iv) Animal Physiology & Reproduction. i) Crop Production and Physiology. ii) Genetics Crop Breeding and Biotechnology. iv) Weed Science and Pasture Agronomy. v) Farming Systems and Horticulture. i) Soil Microbiology & Biochemistry. ii) Soil Survey & Land Use Planning. iii) Soil Physics & Conservation. iv) Soil Chemistry & Minerology. i) Food Microbiology & Biotechnology. iv) Food Quality Control & Assurance. vi) Brewing Science & Technology. i) Forest Resources Management and Economics. ii) Clothing & Fashion Design. iii) Family Resource Management (Home Management). iv) Human & Family Development. i) Business and Organizational Communication. iv) Public Relations and Advertising. vi) Archeology and Cultural Heritage Management. iii) Ph. D in Computational Language Technology. h) Department of Music: M.A. in Music. v) Insurance and Risk Management. v) Social Studies in Education and Philosophy of Education. iii) Environmental and Occupational Health. ii) Postgraduate Diploma (PGD) in Electrical/Electronics Engineering. ii) Software & Systems Engineering. i) Postgraduate Diploma (PGD) in Food and Agricultural Engineering. iv) Distribution and Environmental Engineering. v) Graphics. vi) Master of Arts in Art Education (M.A. Art Education). iii) Chemistry of Natural Products. ii. Industrial/Organizational Psychology and Social Psychology. semesters for all full time students. of the University of Uyo to be equivalent to first degree or holders of recognized Higher National Diploma. Microbiology with 2.75 CGPA (ii) Virology and a Postgraduate Diploma inMicrobiology (PGDM) (iii) MBBCh/MBBS or its equivalent. should not be less than 60% (B). ii. Applicants for LLM & Ph. D in Law must in addition to the above have credit passes in‘O’ Level English Literature. v. Applicants who obtained their degrees through Remedial Programmes must show evidence of having remedied the relevant subjects for their programmesexternally i.e. through WASCE, NECO, NABTEB. vi. In addition to other qualifications, applicants are expected to meet thedepartmental requirements for their programmes. Applicants must return their completed application forms with a Thesis/Dissertation Proposal captured on the prescribed Postgraduate School proposal sheet. Under Innovation, explain the new invention, new approach or new ways of doing things ,new knowledge, etc. that your research will produce. Results obtained by applying extant methodology in a new environment may not be regarded as an innovation. https://uniuyo.edu.ng/eportals and make payment online using ATM Card or in any commercial bank nationwide. After payment return to the portal to complete your registration by clicking on Admission forms Link, then e-Forms, then Register link and enter your RRR. 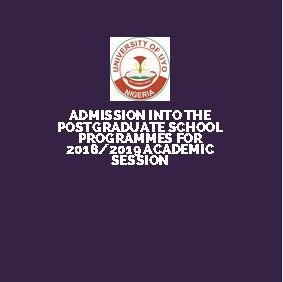 CLOSING DATE: All completed Application Forms with photocopies of relevant credentials and duplicate copy of receipt of payment for the application form should reach the Office of the Secretary, Postgraduate School not later than 90 days from the date of this publication. Please does Uniuyo has PGD Electrical for Part Time ( Weekend)?